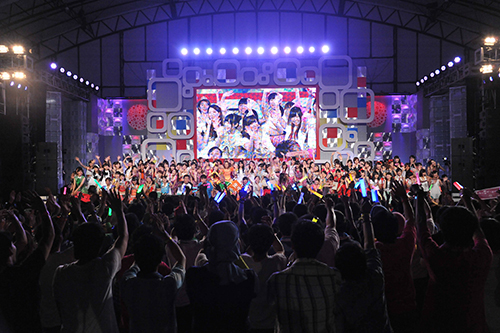 Tokyo Idol Festival 2014 has ended with great success. Thank you for your attendance and we hope you enjoyed the event. The Tokyo Idol Festival is the world's biggest idol festival where idol fans from across the globe come together. In fact, last year's festival attracted a total of 33,000 fans who watched 111 idol groups perform on stage. Commemorating its 5th anniversary, the festival returns again this year with an even more powerful line-up! "Tokyo Idol Festival (TIF) 2014" will be held in the Odaiba/Aomi area Saturday, August 2nd and Sunday, August 3rd. Once again, TIF brings you various idol collaborations that can only be witnessed in Odaiba once a year as well as an opportunity to experience the Japanese idol culture firsthand, like having the chance to see local idols from various regions of Japan. Additionally, 2014 will mark the first year in which TIF welcomes a broader audience, making ticket purchases possible from anywhere in the world*. By doing so, TIF hopes to further expand its presence into an international one, involving idol fans from all over the world. The main stage for TIF will be set up within Odaiba, now the so-called holy ground to idol fans. A number of special stages will be set up including a collaboration stage with Fuji TV's summer event "Odaiba New World"
It's a dream-come-true live event that will have you dancing to idol tunes all day! TIF plans to evolve even further this year in celebrating our 5th anniversary, such as introducing an unprecedented project. There is a solid distinction between the many idol festivals out there and TIF. We hope to bring you the most wondrous stage that can only be experienced at this special event once a year. TIF allows audiences to actually see and feel the event, so please come by to watch the idols in full action. We look forward to seeing you there. ★By Monorail Yurikamome Please on board Yurikamome from JR Shimbashi station. The ride from Shimbashi crossing over the Rainbow Bridge should take about 15 minutes. Please get off at Daiba station. ★By TWR Rinkai Line From major stations like Ikebukuro, Shinjuku or Shibuya, the Rinkai line takes you straight to Odaiba in about 30 minutes. Please get off at Tokyo Teleport Station. ★By Water Bus From the Water Bus station at Asakusa, or any other station. The ride from Asakusa to Odaiba takes about 45 minutes. The details of the stages. Copyright c 2014 TOKYO IDOL FESTIVAL all rights reserved.